Now you can attract – and retain! – more customers for your top level car wash with our new D&S LED Foaming Wax Rain Curtain engineered exclusively for IQ Soft Touch and IQ Touch Free Car Wash systems! Developed by Mr. Foamer Inc. for D&S, this brilliant light and foam display will dazzle your customers as its multi-colored rain curtain passes over their vehicles. With full vehicle coverage and incredible performance even in high-turbulence applications, the new LED Foaming Wax Rain Curtain delivers high-quality wax options for your IQ car wash.
One unit can run single, double, or triple wax as well as high pH or low pH detergent. Each unit includes 3 foam mixers, adapter kit with mounting brackets and foam mixer injector, rain curtain dispenser, and multi-colored waterproof LED light bar. Easy installation and enhanced customer experience make this option a real winner for all of your existing and new IQ car wash locations! A unit running triple-foam conditioner being pumped by a standard triple Flojet pump station is shown in our video. Colors also are shown in the photos. 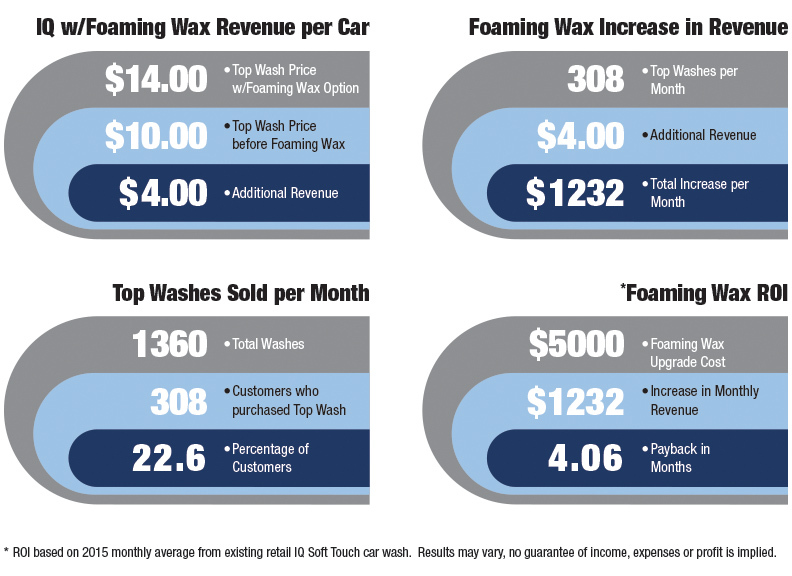 See the “Product Features” below to see the results of research regarding your potential ROI by adding this option to your existing IQ Soft Touch or IQ Touch Free Car Wash System. Contact us today to discuss the LED Foaming Wax Rain Curtain with a D&S experienced car wash professional. We’re here to help!